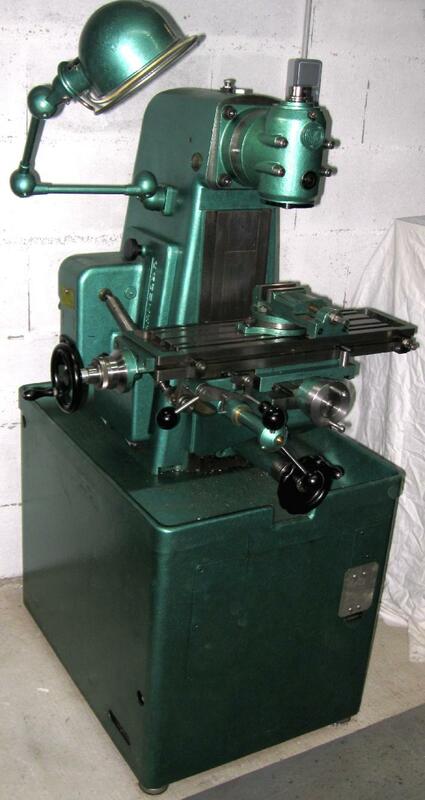 At least two versions of the attractive little French-built Crouzet milling machine were made. The older type, as shown described and shown here, had V-belt drive and a simple, swivelling vertical head with no quill feed. 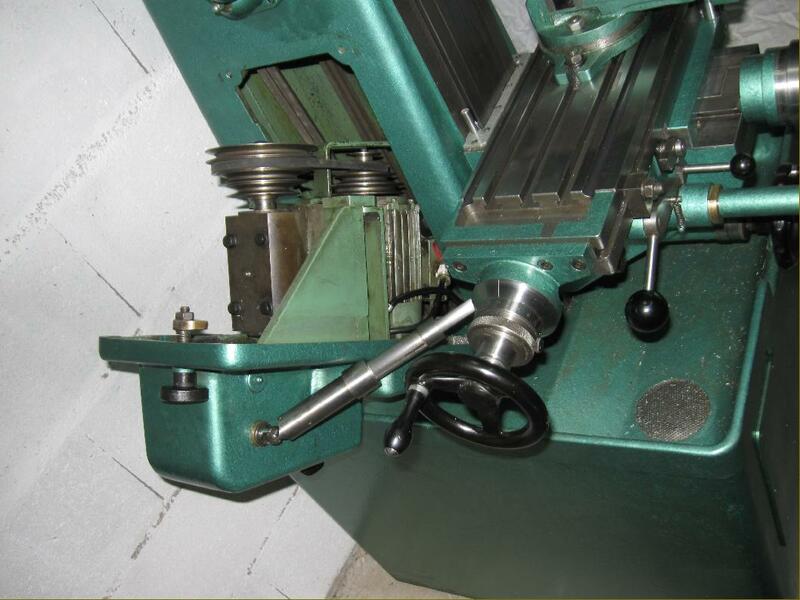 The later version was more highly developed with mechanical variable-speed drive by expanding and contracting pulleys and a universal head with a greater clearance between cutting tool and table. 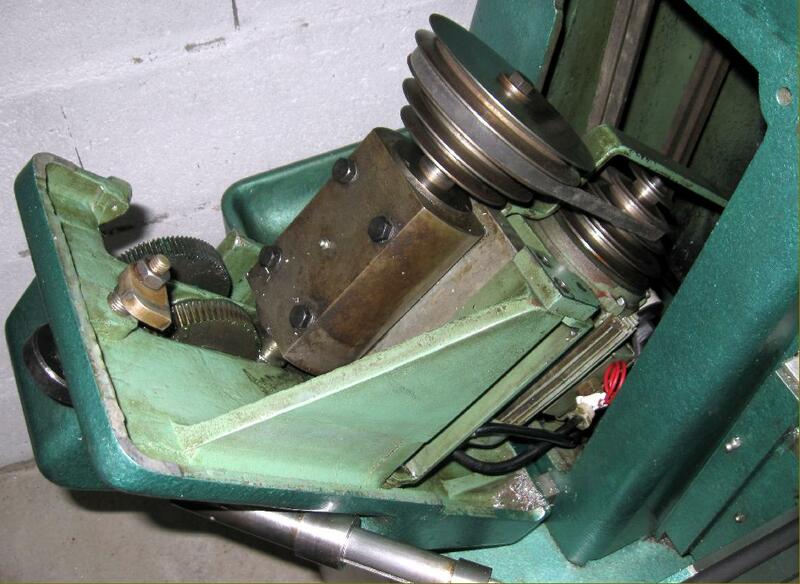 On the original model, drive from motor to the taper-roller bearing spindle was split by two intermediate pulleys, one carried in a slotted arm that allowed it to be self-adjusting as the belts were juggled across a choice of six drive ratios. Combined with a 2-speed, 750/1500 r.p.m. motor this arrangement, with final drive by twin belts, gave a range of twelve speeds from 60 to 2500 r.p.m. 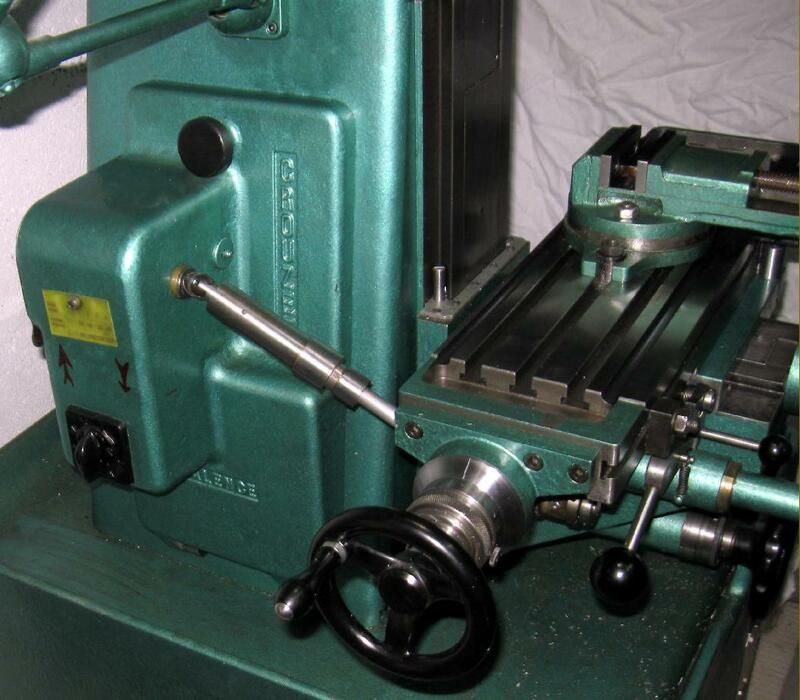 Conveniently arranged to take the common Schaublin W20 collets - and so able to mount tooling from the older Schaublin 12 and some Aciera milling machines - the vertical head was very heavily built in relation to its capacity. Driven by bevel gears, turned by a shaft that inserted into the nose of the horizontal spindle, the head speeds were identical to the horizontal - and so just fast enough to cope with smaller jobs. With the head removed it was possible to bolt in its place a horizontal milling adapter, a casting that held two solid-steel bars with a heavy drop bracket on their end. Whilst this arrangement was not the most rigid of supports for the horizontal cutter arbour (certainly in comparison with a conventional support held either on dovetails across the top of the column, or by bars passing completely through it) for the size of machine it was entirely adequate. One unusual accessory (not illustrated) was a support for long tool holders when horizontal "stub" milling was undertaken. Called in French a "lunette" (or glasses) due to its shape, this was a component carried by the bars of the horizontal milling support. 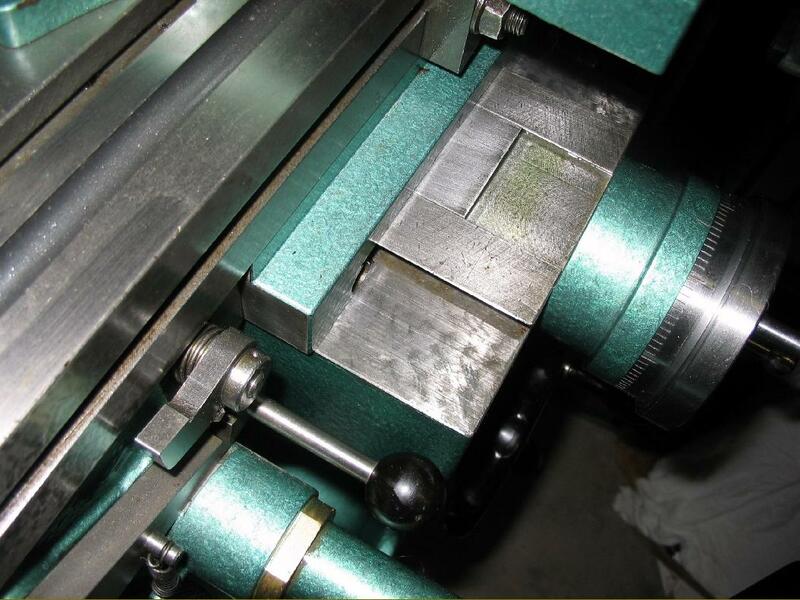 A reasonable 150 mm x 500 mm, the three T-slot table was formed with a coolant trough around the edge and had it travel measured by good-sized micrometer dials that were sharply engraved and finished in a non-glare, satin-chrome finish. Power feeds (in one direction only) were provided by an ingenious but convoluted system: a heavy casting, formed on the inside as an angle plate, was hinged to the left-hand face of the column and carried a 0.4 h.p. motor. 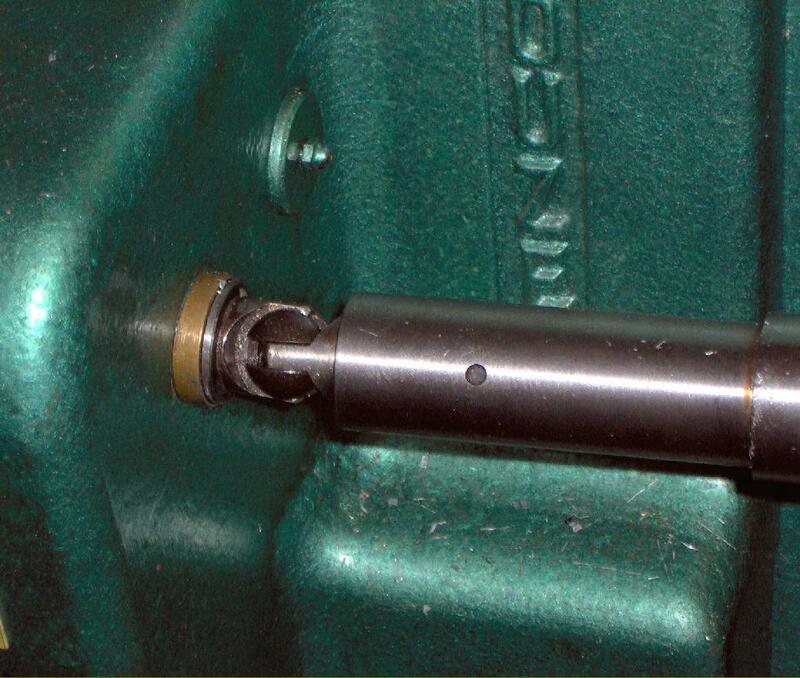 The drive was taken upwards by V-belt to the end of a shaft running in a robust bearing housing. At the other end, the shaft was machined as a worm gear to drive a large "worm wheel" itself connected by a shaft to a pair of "pick-off" gears that could swapped over to give eight rates of feed: 10, 16, 25, 40, 63, 100, 160 and 250 mm per minute. Next came a traditional design of universal (cardan) jointed, telescopic shaft on the outer end of which was a dog clutch carrying a pair of bevel gears. 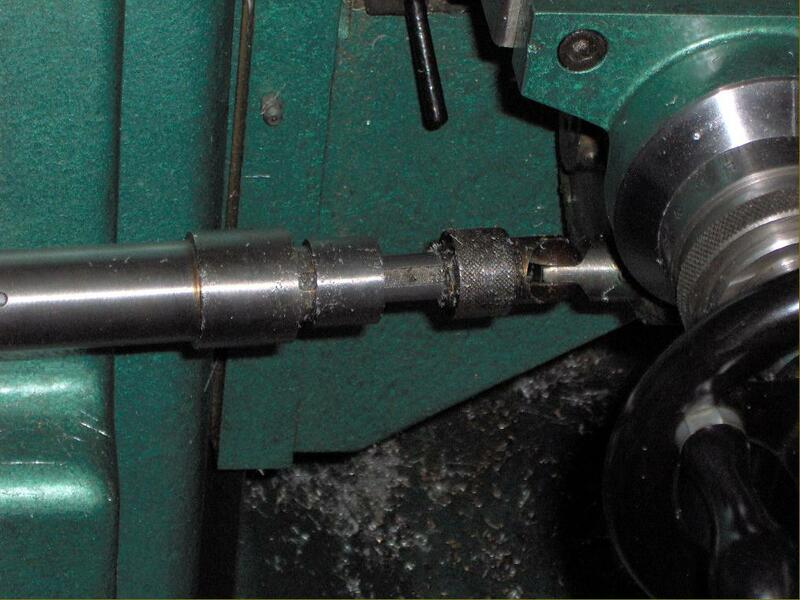 When the gears where engaged the drive was transmitted to a second pair of bevel gears - one of this pair being fitted as a collar around the table feed screw and driving it through a key. Neat though this arrangement appeared, one practical difficulty stood in the way of complete satisfaction: when a speed change was required the plate had to be swung open, a bolt loosened and the bearing shaft repositioned before the V-belt could be moved from pulley to pulley. 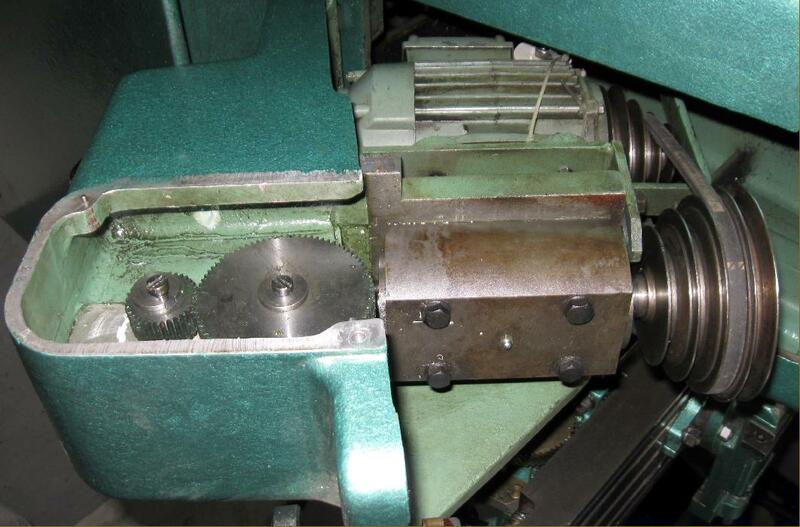 However, this time consuming and (according to users) awkward operation can be circumvented today by leaving the belt on the middle pulleys and controlling the motor with an inverter, variable-frequency drive. Another drawback was that the table-feed engagement gears were completely exposed - and so subject to premature wear from chippings and dirt. 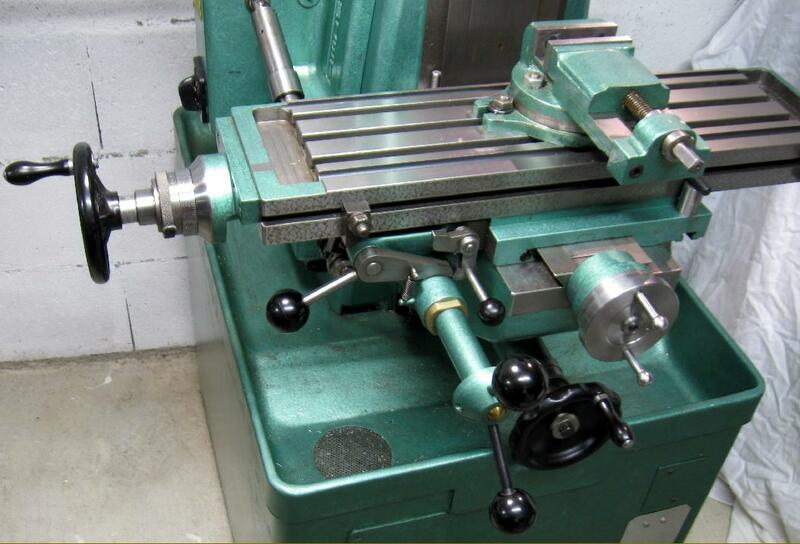 In addition to the normal feed screw, when a quick-action slotting feed was required, the table's could be rack driven by a two-handle capstan wheel. Cleverly, this was provided with gear system that enabled either a slower or quicker motion to be selected by the operator.. Final drive out the universally-joined, telescopic table drive shaft was through a pair of "pick-off" gears that could swapped over to give a total of eight rates of feed.